Toshiba is the tech brand of your cool uncle - the kind of company that doesn’t rush to market with a half-baked product but takes its time and refines its designs until they are perfect. Truly innovative. 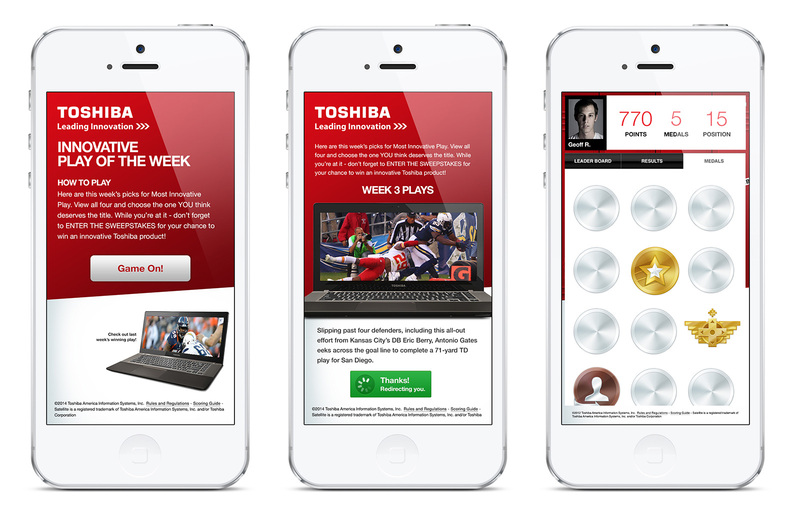 Socialtyze was tasked with integrating Toshiba’s brand within a social media campaign that produced original, innovative and dynamic content. Over the campaigns a 10-week period the Sports Innovation app that allowed users to vote on the most innovative NFL plays. Each week during the 2012-2013 season, Socialtyze sought out truly unique and creative plays that were a little unorthodox but produced spectacular results. Socialtyze developed a Sports Innovation app that allowed users to vote on the most innovative NFL plays. Each week during the 2012-2013 season, Socialtyze sought out truly unique and creative plays that were a little unorthodox but produced spectacular results. To reward engagement, we developed a unique system of badges to showcase the talents of the application users. To house the badges as well as each player’s scoring achievements, we developed a user hub that served as the locus for engagement between each week’s plays.